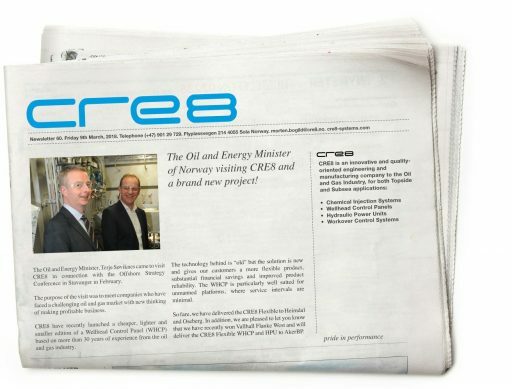 The Oil and Energy Minister of Norway visiting CRE8 and a brand new project! The Oil and Energy Minister, Terje Søviknes came to visit CRE8 in connection with the Offshore Strategy Conference in Stavanger in February. The purpose of the visit was to meet companies who have faced a challenging oil and gas market with new thinking of making profitable business. CRE8 have recently launched a cheaper, lighter and smaller edition of a Wellhead Control Panel (WHCP) based on more than 30 years of experience from the oil and gas industry. The technology behind is “old” but the solution is new and gives our customers a more flexible product, substantial financial savings and improved product reliability. The WHCP is particularly well suited for unmanned platforms, where service intervals are minimal. So fare, we have delivered the CRE8 Flexible to Heimdal and Oseberg. In addition, we are pleased to let you know that we have recently won Vallhall Flanke West and will deliver the CRE8 Flexible WHCP and HPU to AkerBP.